My rendition of detail from Rembrandt’s painting Crucifixion I did when I was 18 or so using a photograph of this masterpiece from an art book on Rembrandt as a model. 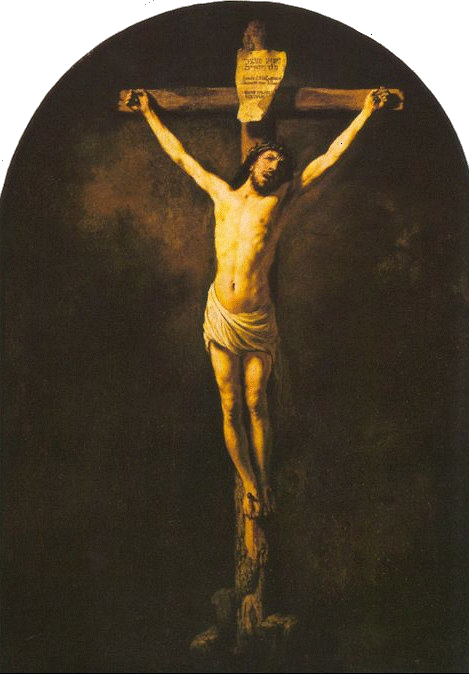 This painting is little known in part because it hangs in a parish church in a small French town and was only re-discovered in the 1950’s. It also makes scholars very uncomfortable. 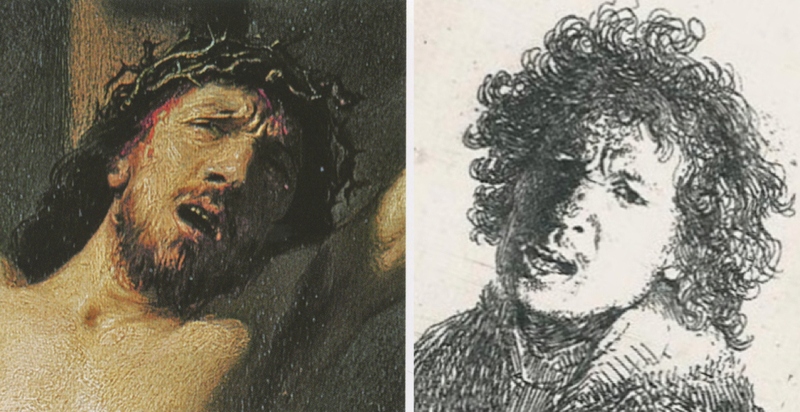 Not until 2009 did two art historians, Shelley Perlove and Larry Silver, note in a book on Rembrandt’s faith that Christ’s contorted face resembles the artist himself in an engraving, Self-Portrait with an Open Mouth, made the year before. This entry was posted in Art and tagged Amateur, Art, Art history, Christ, Copy, Crucifixion, Detail, Drawing, Paint, Painting, Pastel, Rembrandt, Rembrandt van Rijn, Self-Portrait, Sketch. Bookmark the permalink. You’re talented! I’d love to be able to control my pencil that way. I took a course, “Drawing on the Right Side of the Brain” many years ago, and I must admit it helped in “seeing” things, but I’m just not an artist. My favorite medium is photography — but have a long way to go to make it artistry. Who let that woman touch that painting. 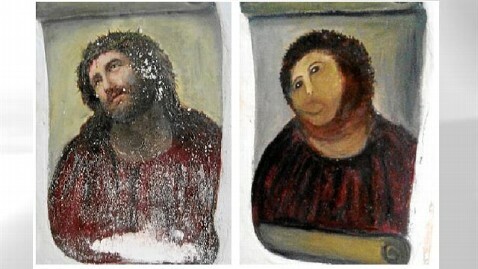 That’s not restoration! That’s defacing, literally. Oh, thank you so very much! You are too kind. I am glad you like my drawing. Yes, I prefer photography these days also. Drawing and painting takes real talent and also a lot of patience and determination. I agree with the defacing, totally. LOL!